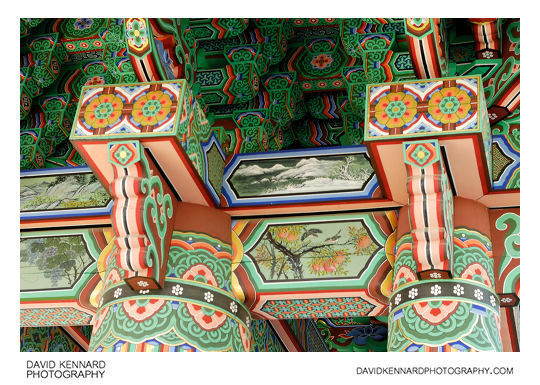 Jogyesa temple is the head temple of the Korean Jogye order of Buddhism (대한불교조계종). It is based on the Seon (선) school of Buddhism (known as Zen Buddhism in the west), which dates back to around 820 CE in Korea. 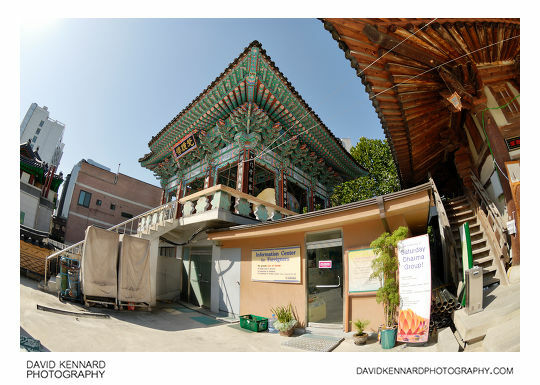 The temple is tucked away in central Seoul, surrounded by large buildings. 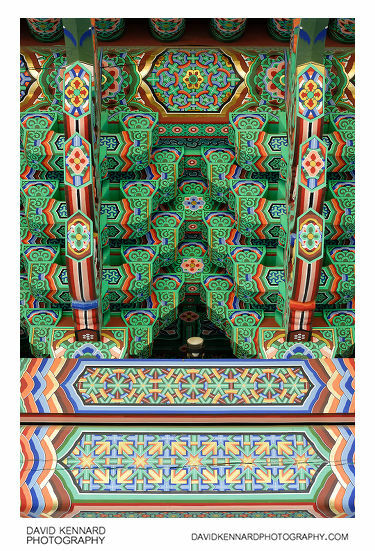 Jogyesa temple has a nice entrance gate, painted in the traditional Korean Dancheong (단청) style. I didn't take any photos of the gate itself, but did try to get some 'detail shots' of the painting and woodwork of the top of the gate. You can see in the photo above that as well as the floral patterns the gate also has detailed paintings of mountains and birds on it. 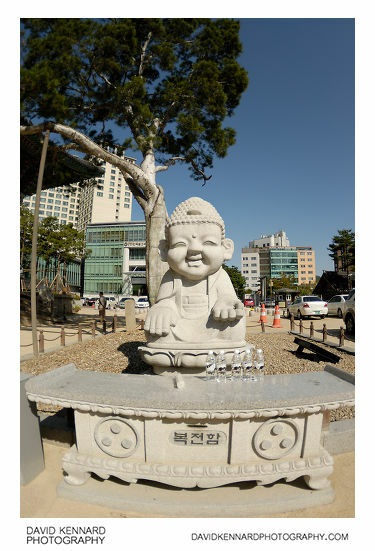 Near the main hall of Jogyesa is this baby Buddha statue and a Bokjeonham (복전함) table where offerings of bottles of water are placed. Behind the statue is a 500 year old white pine tree. These trees do not grow naturally in Korea, and it is thought to have been brought here from China. There is a new looking 10 storey stone pagoda (10층석탑) in Jogyesa, which I think is a replacement for an older 7 storey stone pagoda. 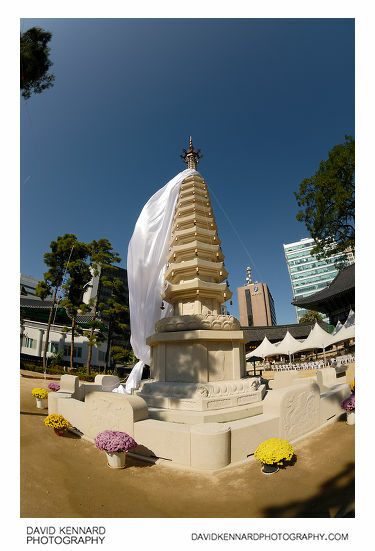 The older pagoda was said to contain a piece of Sakyamuni Buddha's sarira, which was brought to Jogyesa from Sri Lanka by the Zen master Dharmapala in 1913. This relic would have moved from the old pagoda to the new one I think. I'm not sure what happened to the old seven storey pagoda, but I didn't see it anywhere. Here you can see the Beomjongru (범종루) bell pavilion and the Information Center for Foreigners. According to the information board the Information Center opens at 11am, though we waited until after 11am and it was still closed. 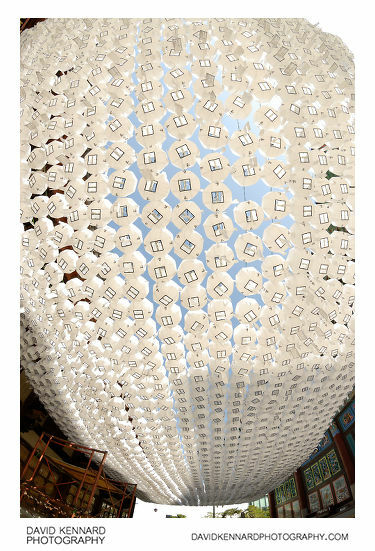 Between Geungnakjeon and the main hall Daeungjeon there were a large number of white paper lanterns hanging. In May during the run-up to Buddha's birthday on May 24th, they hold the Lotus Lantern festival, where the temple grounds have thousands of coloured lanterns suspended above them. Obviously I didn't see this, being there in October, but if you're in Seoul during May it would be well worth checking out, especially when the lanterns are lit at night. 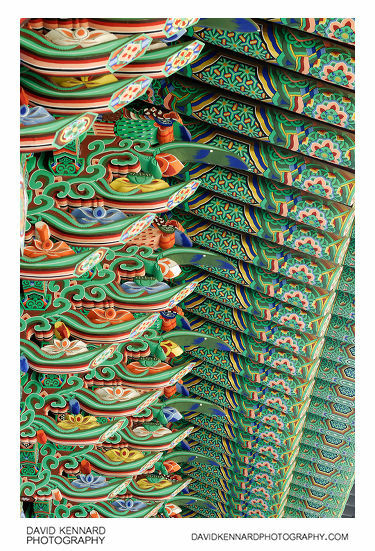 See the next post for some more photos of Jogyesa temple.